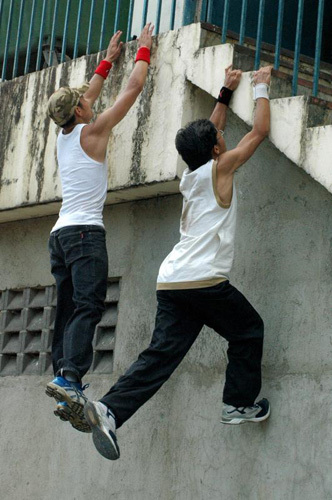 Parkour is an art where participants run along a route attempting to negotiate obstacles in the most efficient way possible using skills such as jumping, climbing or more specific parkour moves. Parkour from an outsiders view is just like running, dodging obstacles and jumping from point to point. But for those who practice the art, it’s not only the physical aspect but equally with the mental aspect because you develop self-confidence, quick decision making and critical thinking which you can apply into your daily lives. The moves were awesome and I enjoyed a lot looking at these guys move from point A to point B in a very “stylish” way. 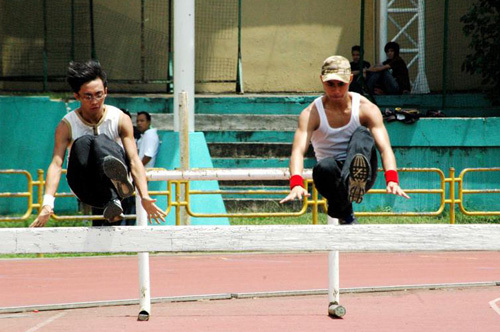 But most often, Parkour is practiced without spectators and is not considered to a performance. Although, it’s already gaining popularity especially here in the Philippines where it’s used in Movies or TV Commercials. 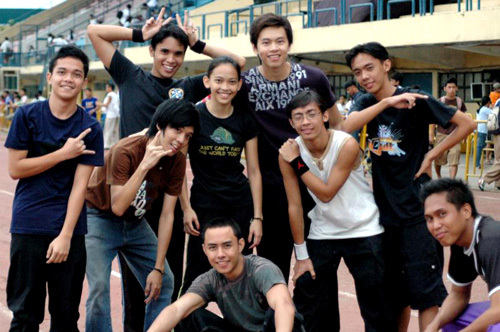 Parkour Sugbo is the group of Traceurs here in Cebu. 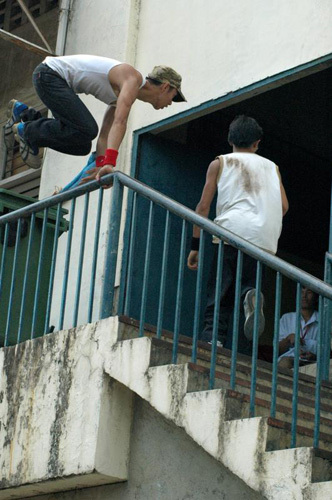 It was founded by Sol who is an avid Parkour tracuer and they conduct free parkour sessions almost every week. 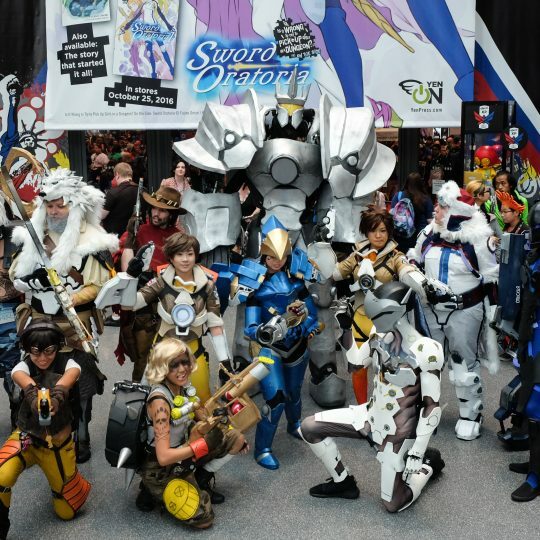 In the second picture, it’s Sol, Dale, Vanz, Barbie, Me, Kyle, Red, Jay and Nico. You can get to know more about them in MagTV Na this Oct 18. I’m sure you guys will love it. Well, yes and no. First of all, yes it is dangerous and risky but every sport does have their share of risks. And no because Parkour is NOT considered as a sport. It’s more of an art. There you have guys. I also did some Parkour moves of my own! Hahaha All thanks to Sol and his group. They taught me some very basic moves. Haha. If you guys are interested to try Parkour, post your names here and I can refer you to Sol. They conduct free sessions and are open to new members. Thanks again guys! Hey Jay! No wonder! Now that you mentioned it, you both do look the same! Haha Oh. Final exams period pala ngayon. Hehe. Sorry for arriving late, hihe .. traffic a.u! Hoping to know you more ..
Hi..Parkour Sugbo nahan ta ko patudlo unsa kylangan ana? Hi jie, jay here, one of the PK Sugbo traceurs. If you’re a minor, we badly need your parent’s/guardian’s approval so that they’ll know what you’re getting into. 😀 But we assure you that we’ll teach you first all the safety precautions you’ll need to know in order for you to train parkour with the least possibility of injuries. And as for the gear/attire, all you need are comfortable attire and trainer shoes (the ones that can absorb impact and has good grip). For more info, you can visit us in our facebook group account. 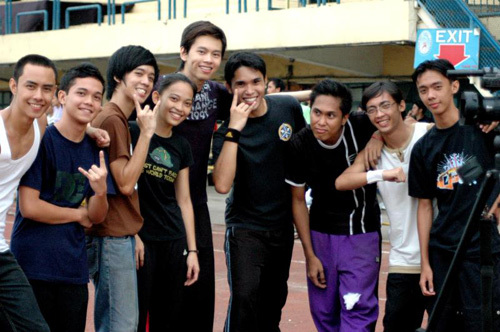 Just search for “Parkour Sugbo” Group and feel free to ask any questions regarding parkour. By the way, where are you staying in Cebu? this is very great to see.thanks for sharing this stunning snaps.i fins adventure in this game. Hi jay, jie here actually 24 na ako living in Lapu lapu City, Cebu. anong schedule nyo sa practice? 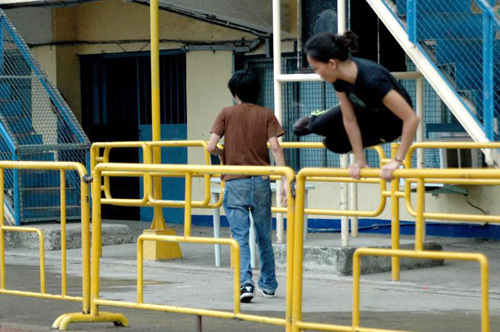 kc gusto ko talaga matoto ng Parkour as my exercise ok lang ba yon? Hey Nico. Of course. No problemo yun! Haha. Sorry for forgetting your name. I remembered it was something like Nicholas. Haha. Nico lang pala! Haha. it is really nice post with have good jumping, climbing or more specific parkour moves. It is really good topic. Nicholas! haha I think it’s a better name than Nico! hey…i saw MAGtv a while ago and i saw the parkour feature. i’ve always envied that technique when i saw casino royale (not sure if the balck guy was doing parkour). anyway, i tried searching parkour sugbo in facebook, just as what the above said, pero wala naman silang mahanap na grupo na ganon. Don’t worry Lilan, Sol and Jay may be able to help you follow those techniques in Casino Royale. Hehe. You can join their group for free. It’s really fun! You can find the facebook group here. 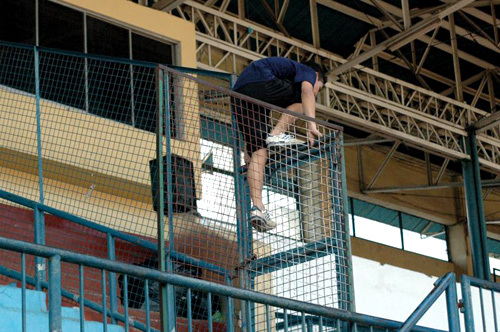 Parkour Sugbo. Thanks for adding the link Billy! nice write up mcbilly about parkour and freerunning. although brief it packs a lot of the backgrounder to the disciplines of movements 😀 as well as its fundamental philosophies. it’s what in terms of pk and freerunning terms of being “precise”. Hi tracers i just had a thought: i play handball and we have handball shoes .the shoes are really light and they have a rubbery sole and its sticky. hey,cheLcey here..i realLy want to join parkour. but oK ra f girL ko.? yah…we have girl practitioners man sad.